Toyota Hilux Revo Rocco Smart Cabin 2018 is a vibrant 2-door pickup truck ideal for its urban trendy 4×4 dynamic appeal for customers. 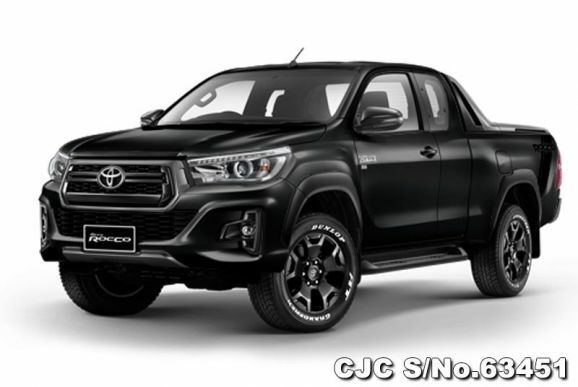 This aggressive style actionable right hand 4×4 off-road pickup is getting readily popular among younger people in Tanzania as it is specifically designed for those who are extremely eager of harsh challenging off-roading. It creates a true passion for outdoor wildlife adventure drive recreational journey for both locals and foreign travelers in Tanzania. There are also many other kinds of exciting activities like as mountainous ride and African desert safari for travelers to have an incredibly fun experience. In terms of design, Rocco offers a super sleek robust exterior structure for rugged off-road driving performance. It is a Thai made stylish pickup composed of glittering shine accessories such as front LED headlights, daytime running lights, under spoiler C- Shaped chrome appliqué, hexagonal shaped front glossy black and gray emblem grille, lower grille, front bumper, power side mirror with LED turn signal indicator, front radio antenna, and 18-inches alloy wheels. On the rear side, it offers a nice display look with a high mount stop light, LED taillights, side step and rear step bumper. Interior Design offers a highly decorated seating design with ease of legroom and headrest space for all passengers. The rear side cargo compartment provides a widely spacious loading and storage accommodation. The interior dashboard cockpit panel offers a fancy appeal and equipped with advanced key features such as Optitron Meter, navigation system, differential lock system, theft deterrent system and immobilizer. Power Steering, Power Windows, Anti-lock braking system, central locking, and dual airbags are also essential added features. By means of driving performance, it offers 2.8 liters of the diesel engine with a manual speed transmission system. Toyota Hilux Revo Rocco Smart Cabin receives immense demand and value in Tanzania and all over African region for customers to have a pleasurable outdoor leisure drive for everyone.